The global printing paper market has been witnessing the entry of new market players over the past decade. This rampant barging of new entrants into the market is due to the rising demand for printing paper across several industries and segments. It is anticipated that the established market player would introduce new business strategies in order to mitigate the intense competition from the new entrants in the market. Improvement in quality of printing paper is projected to be the primary move of the leading market players in their quest to retain their dominance in the market. Furthermore, the ability of these leading players to mass produce is also expected to fortify their position in the global market for printing paper. Besides this, rigorous marketing and innovative business hacks are likely to be amongst the defining traits of the leading market players. On the other hand, the small and medium-sized players are projected to tap into the large scale demand from school and college students, office goers, and legal practitioners. Partnerships are also expected to be a key highlight of the small and medium-sized players in the global market for printing paper. Some of the prominent market players identified in the global market for printing paper are Sonoco Products Company, DS Smith Packaging Limited, WestRock Company, Stora Enso Oyj, Paper Company, Pratt Industries, Inc, Oji Holdings Corporation, KapStone Paper and Packaging Corp, Georgia-Pacific LLC, Mondi Group plc, Great Little Box Company Ltd., and Smurfit Kappa Group Plc. A report published by Transparency Market Research (TMR) forecasts the growth trends of the global market for printing paper. The global market is expected to grow at a steady CAGR of 4.9% over the period between 2018 and 2028. The need for printing paper across several industries and sectors has led to the boisterous growth rate of the global market. A tremendous amount of demand shells out of the printing press that has remained the primary channel for dispelling over the past decades. Furthermore, printing of circulars, pamphlets, and notices in business units, schools, colleges, and other institutions has also amplified the growth of the global market for printing paper. Several print shops have surfaced across cities and town centers, which has further propelled demand within the global market. The industrial sector has also been an ardent consumer of printing paper and has offered growth spaces to market players. Besides this, the intensive paper work required for governance and planning within regions has also led to an increase in demand for printing paper. 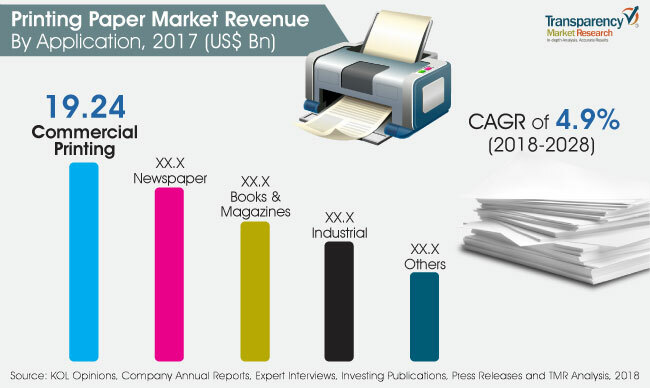 Despite these positive factors with regards to the global market, the emergence of e-newspapers, e-governance, and other digital services could hamper the growth of the global market for printing paper. The market for printing paper in Asia Pacific is expected to outdo all other regional markets in terms of revenue. The growth of the Asia Pacific market owes to the huge-scale investment made by international players across the region. The growth of key industries in Asia Pacific has necessitated the need for paper work, documentation, and other hard copy materials, thus, giving an impetus to the growth of the global market for printing paper. The review is based on TMR report titled, “Printing Paper Market (Paper Type - Coated paper, Uncoated Paper; Distribution Channel - Hypermarket/Supermarket, Retail Stores, Convenience Stores, Ecommerce; Application - Newspaper, Industrial, Commercial Printing, Books & Magazines, Other Applications) - Global Industry Analysis, Size, Share, Growth, Trends and Forecast 2018 – 2028”.